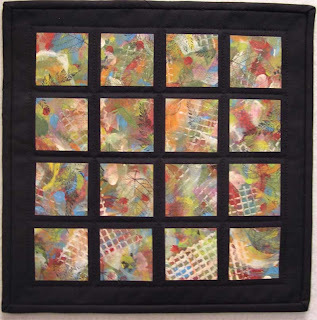 This is a 12" art quilt that I made for SAQA Art quilt of the Month group. The next picture is a detail shot of one of the 2" cubes. Below is a picture of the fabric before I transformed it. 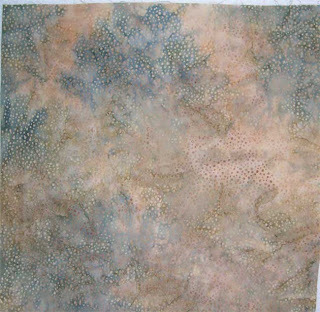 The fabric above is the result of painting and stamping. I used acrylics and fabric paint. The leaf images are stamped with a pigment ink. I backed the painted fabric with Wonder Under and then cut it into 2" cubes. I made a smaller one of these recently so I guess I have started a series of "cubes". Today, I am sharing with you something I wrote in my journal on Memorial Day last year. Our daughter visited us that weekend and we decided to take the Metro to the National Mall in DC. Of course it was very crowded that day, but it turned out to be a very memorable day for all of us. As we walked along the way, we walked through the beautiful World War II Memorial. Next to one of the names was a flag wrapped in a plastic bag with a wedding photo in it. So many stories untold. The crowds were tremendous as we got closer to the Vietnam Memorial. We got in the long line waiting our turn to pass by the wall. I noticed a small group of veterans wearing their traditional black leather vest and blue jeans with their medals and patches proudly displayed. They were probably members of "Rolling Thunder". They were lined up in front of us ready to proceed down to the wall of names for a ceremony. Among the group was a blind veteran led by another veteran who only had one leg. (All war casualties I suspect). They looked like they were all in their 50's or 60's. Standing proud, they started their formal march down to the wall. One turned around to go back to get his buddy who was still looking in the book of names to find his unit's site. His friend gently pulled him away and he followed. While I was standing there I thought of how this was just an example of not leaving his buddy behind...just like in war time. They got back into the march with their unit which was just a small group of men...maybe all that was left after the war. The progression to the wall was slow and very quiet as some were on crutches. The crowd parted to let them pass and I could see a somberness fall over the people as they observed the march. We finally made it to the long line and got to the wall. As we approached, it really struck me how many names are there...all the loss of young life. The memorabilia left along the wall...flowers, letters, pictures and one sign looking for anyone who "knew her daddy" she never got to meet. Farther along the wall, there were some of the veterans who had been in the ceremony. One of them was clinging to a wall, his arms stretched across a group of names. He was in tears, crying "here they are...all of them...my guys" and another veteran was comforting him while they both cried. Of course most of the crowd was crying at this point. Another veteran was touching every name being careful not to miss a one as he walked beside the wall. The bond between combat veterans is so strong. They are the true definition of "brothers". Those of us who haven't experienced it can only imagine the conditions and experiences they shared in a hell called war. I have lots more I could write about this day but I think it is a time I will never forget. I can't really put into words the feelings I have each time I visit the memorials but I highly recommend the experience. It's a place where you can feel close to God. 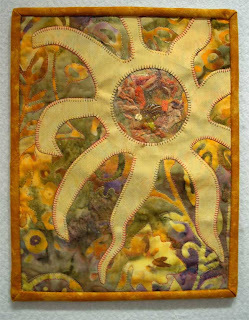 This one has fantasy fabric as the center of the sun. Fantasy fabric is bits of beads, yarn, fabric bits, buttons, etc. all caught under a layer of bridal tulle. Then, it is stitched around the edges to hold it in place. The bits and pieces move when you shake or move the quilt so it can be interesting. I named this "Here Comes the Sun" because it is almost summer, my favorite time of year. This year, we will take a beach vacation and that's my favorite place to be. The ocean brings new treasures to me everyday. Serendipity. Here are my new "cubes" I got at IKEA. 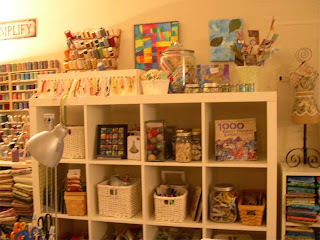 It has helped tremendously to organize my supplies and gives me a place to display artwork. I like to have things out where I can see it to use it. After I took these pictures, I decided to use the two lower cubes to hold two sewing machines for easy access. 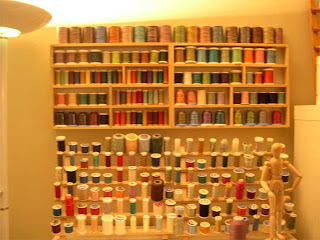 This is my thread rack. The wall racks are wooden silverware trays I bought at Target. I put hangers on the back and they are perfect for holding spools of thread. The next photo is a photo holder I found at IKEA. 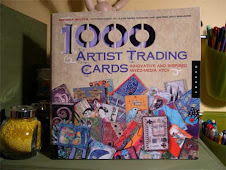 You bend all the spokes up and it holds some of my ATCs for display. Notice the little jars of buttons? I got them from a scrapbook store. They have such cool colors like the spring green, watermelon and aquas that I like. 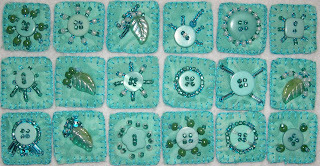 This next picture is a little holder for my dyed tags. I love the color of the tags (dyed with Easter egg dye). 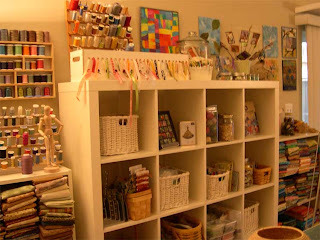 The large jar holds ribbons not on a spool. 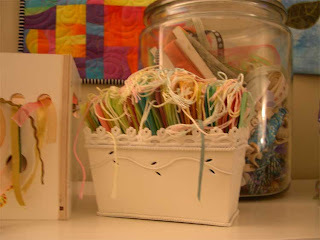 The spool ribbons are in my ribbon box on top of my cubes as you can see in the picture. OK, that's the new stuff for now. Today is our beautiful daughter's birthday! Happy Birthday, Traci! This is a picture of her when she was almost 3 years old, about 26 years ago! 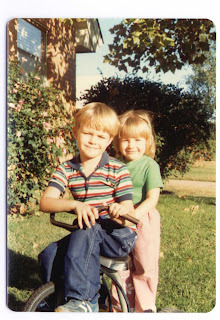 The guy driving the trike is her older brother, Matt. Traci was born in Okinawa, Japan. She arrived in the states at age 5 weeks and she's still a world traveler, still a sweetheart, and still beautiful. Happy Birthday, Traci! 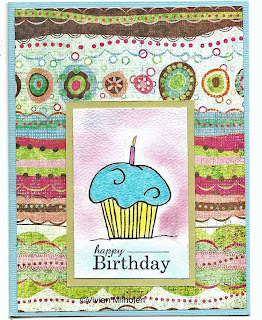 This is a picture of the birthday card I made today for Traci. I actually drew the cupcake free hand, then used Shimmering H2o's watercolor to paint it. Then, I used pigment ink to shadow around it while masking the design. The background paper is by Basic Grey. I hope she likes it! I just signed up today for QSDS! I'm taking Confident Color taught by Rosalie Dace. The classes are in June in Columbus, OH! I get to share the time with my friend, Susan. I can't wait! Also, it's NQA that week and I get to meet up with my other good friends! Yippee! It will be National Friend Week for me! I really miss all my friends! We always have a great time together...we think alike. Nope, not a dangerous thing, just lots of laughter! 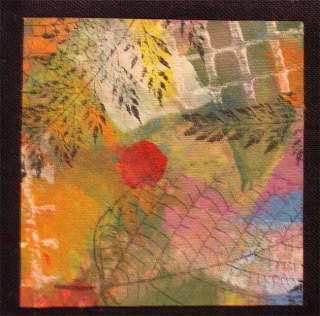 These are tiny (1") squares of art. They are called "inchies". They are made just like a quilt. 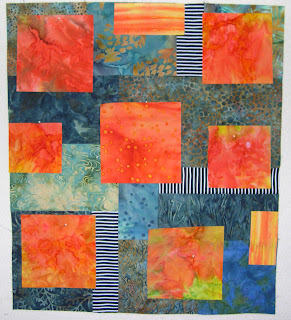 I placed batting between 1 1/2" squares of batik fabric. Then, I beaded through the top and batting. I ironed "Heat n' Bond Lite" to the backing and ironed to the top/batting layers. 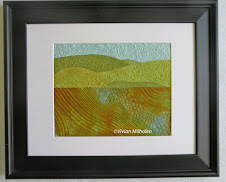 (note: I usually use Wonder Under when working with batiks, but it was OK to use Heat n Bond for the back of these) Then, I trimed to 1" and handstitched the edges using a buttonhole stitch and two strands of floss. I actually got these all beaded while I was in California. 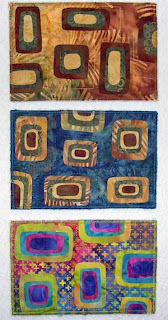 These are three postcard size quilts that I just made. They are for a class, "Self-Expressions Studio" that I am taking. 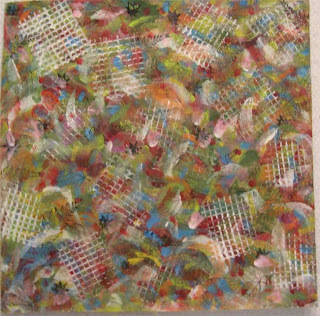 The size is 4" x 6". I first cut the background 4 1/2" x 6 1/2". Then, I ironed wonder-under to the fabrics and cut out the shapes randomly. After ironing the pieces to the background, I backed it with Warm N' Natural batting and did a bit of quilting. Then, I backed it with watercolor paper and used a zig zag stitch for the edging. These may go in a frame or I can mail them as postcards. It's a nice day here, but a bit chilly...only in the 60's, sort of like the California weather last week. I just took a long walk (on my daily to do list, now). I hope I can start running again soon. After our move, I was a slug and now I have to get back to exercising again. Hopefully, more art tomorrow.